From left: CEO Jasmine Huggings-Daly, Past President Kay Martin-Jack, President Jimmie Forde and SVG League representative, Montie Chambers at the opening ceremony. 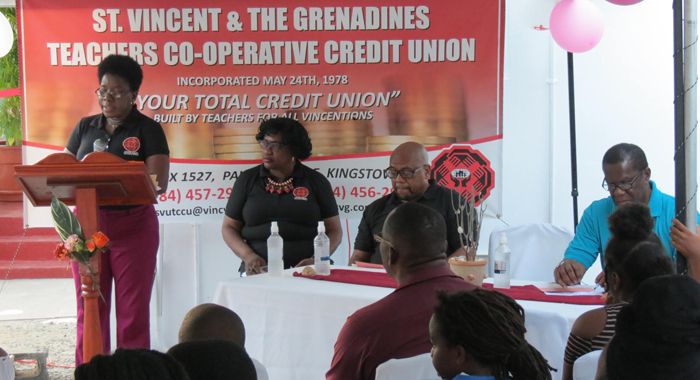 The St. Vincent and the Grenadines Teachers Co-operative Credit Union Ltd (SVGTCCU) has accomplished yet another major milestone in its 40-year history. The SVGTCCU opened its Canouan Branch last November. Chief Executive Officer, Jasmine Huggins-Daly said the branch was long in coming but commended the former CEO, Julian C. Jack for laying the groundwork and ensuring the existence of an agent on the island. She also expressed gratitude to the Board of Directors of the SVGTCCU for the modern facilities with which the office had been outfitted. In his address, President Jimmie Forde noted that the opening of the SVGTCCU Canouan Branch is one of the major achievement of their 40th anniversary, being celebrated this year, noting that the theme of the celebration is “Forty Years; We Care, We Share”. He further highlighted the successes and growth of the SVG Teachers Co-operative Credit Union over the 40years, including assets of EC$128 million and more than 12,000 members. Forde invited all of Canouan to participate and enjoy the benefits and services available. These include the Supplies Outlet and Bookshop, online and ATM services, loans and various saving options. The St. Vincent and the Grenadines Co-operative League Ltd, of which the SVGTCCU is a member, was representative by Montie Chambers, who applauded the credit union on the opening of its Canouan branch. He also pledged full support on behalf of the SVG Co-operative League in seeing the Canouan branch grow and develop. The audience was treated to a well-prepared choral speech by the children of the Canouan Government School. A highlight of the presentation was their reference to the presence of the SVGTCCU Supplies Outlet and Bookshop on the island. They gleefully proclaimed that they no longer have to travel to St. Vincent to purchase books. The children said the savings from “travel and stay over” will ensure that they all get book bags and other supplies. During the ceremony, Forde on behalf of the SVGTCCU’s Supplies Outlet and Bookshop presented seven boxes to the school. Gift vouchers were also given to Anya Allen and Kacey Farrell, the two students of the Canouan Government School who won the recently held Southern Grenadines Spelling Bee Competition. The office and the Customer Service Representative, Jaime Simmons, was blessed by Pastor Asbert Garnes. Former head teacher of the Canouan Government School and longstanding member of the SVGTCCU, Bertina Sandy, cut the ribbon to declare the office opened. The office hours are 8:30 a.m. to 4:30 p.m., Monday to Thursday; Fridays 8:30 a.m. to 4 p.m. and on Saturdays from 9 a.m. to 11:30 a.m.